Here's another good use for farro, the chewy having-a-moment wheat grain. This recipe makes a simple pilaf perfect for a side dish to a meat or other vegetable entree. 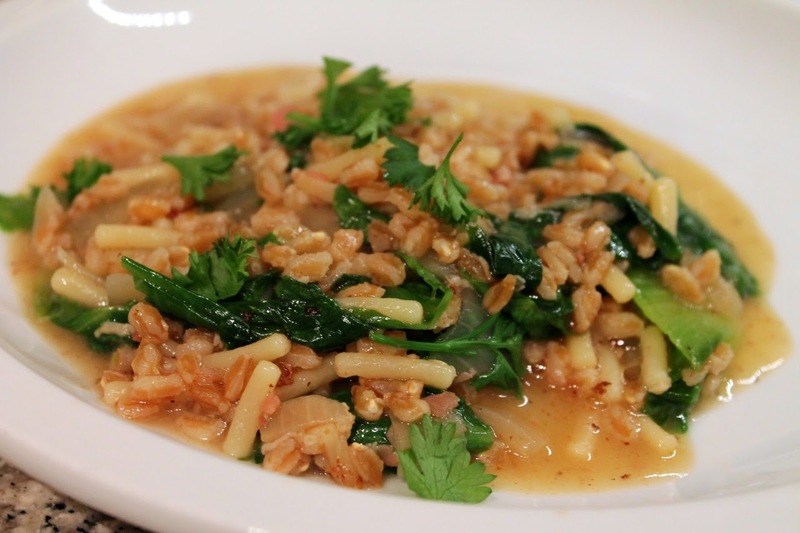 I've paired the farro with brichetti, a stubby pasta that resembles broken spaghetti. 1. Heat olive oil over medium-high heat in a Dutch oven or large saucepan. Add pancetta and cook, stirring frequently, until browned, about 5 minutes. Add onion, season with salt and pepper and cook, stirring frequently, until the onion softens, about 5 minutes. Stir in the pasta and cook, stirring frequently, until it starts to turn golden, about 2 minutes. Add the farro and cook, stirring frequently, for another 2 minutes. 2. Add the chicken broth, stir to scrape up any bits from the bottom of the pot and bring to a boil. Reduce heat to simmer, covered, for 30 minutes. Remove lid and stir in the escarole. Cook until wilted, about 5 minutes. Stir in the parsley and serve. I don't remember when you made this, but I'm sure it was delicious. It looks like the kind of dish I would've shoveled into my mouth with glee.